Brand New FlySky FS-iT4S 2.4Ghz 4ch Touch Screen Radio System (AFHDS2A). Full set with Receiver and Telemetry modules. For cars, buggies, trucks, boats. FS-CPD01 magnetic rotation speed telemetry module. 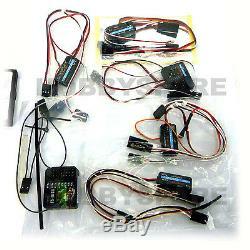 FS-CPD02 optical rotation speed telemetry module. FS-CVT01 external voltage telemetry module. 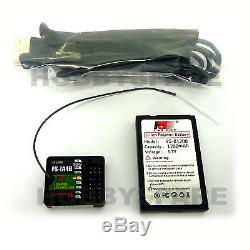 FS-B1200 3.7v lipo battery pack for transmitter. USB cable, Soft rubber handle & CD manual. The new iT4S, loaded with tons of features and new functions, will bring you a whole new experience on controlling your RC models. Compared to the iT4 that is capable of storing 20 models in its internal memory and has the ability to graphically represent all trim, exponential, and dual rate adjustments, the new iT4S is capable of even more. The iT4S features a second-generation automatic frequency hopping digital system transmitter, capable of receiving transmission parameter information, such as voltage, temperature, and speed from the receiver, and that's not the only way you can use it. 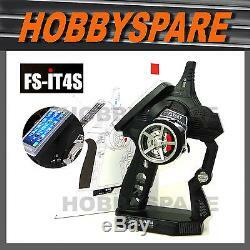 Besides AFHDS and AFHDS2, this new radio system also provides you AFHDS 2A 1-way and AFHDS 2A 2-way for your preference. 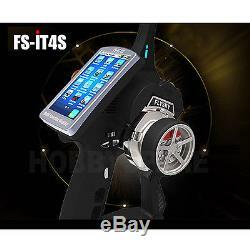 The FS-iT4S' 3.5 inch zinc alloy styled screen features LCD white backlights and resistive touch screen functions. 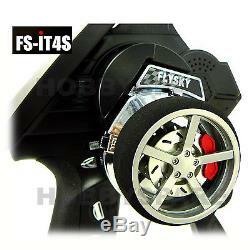 It also uses the FS-iA4B receiver, which is another new design from FlySky. One revolutionary feature you don't want to miss out on from the iT4S is its new competition mode. The competition closes the 2-way transfer system, so signals will only go from the remote control to your model, which effectively avoids many factors that may affect your racing capabilities. New design receiver and telemetry sensors. End Point & Sub-trim Adjustment. Steering Exponential & speed Adjustment. Throttle Neutral (Dead Zone) Range Adjustment. Throttle Exponential & curve Adjustment. RF Range: 2.4055 - 2.475GHz. RF Power: less than 20 dBm. Low voltage warning: less than 3.7V. ST Range: 90 L:45 R:45. TH Range: 45 F:35 B:15. The item "NEW FLYSKY FS-iT4S 2.4Ghz LCD TOUCH SCREEN 4CH RC COMPETITION RADIO FULL SET" is in sale since Friday, August 14, 2015. 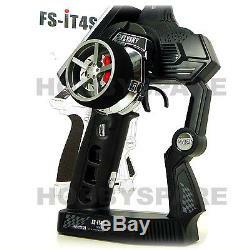 This item is in the category "Toys, Hobbies\Radio Control & Control Line\RC Model Vehicle Parts & Accs\Control, Radio & Electronics\Receivers & Transmitters". 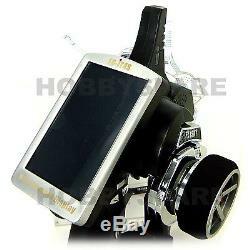 The seller is "hobbyspare" and is located in Victoria. This item can be shipped worldwide.